This sweet little pillow is made from recycled jeans and re-claimed fabrics from 2 beautiful, contrasting shirts of rayon. 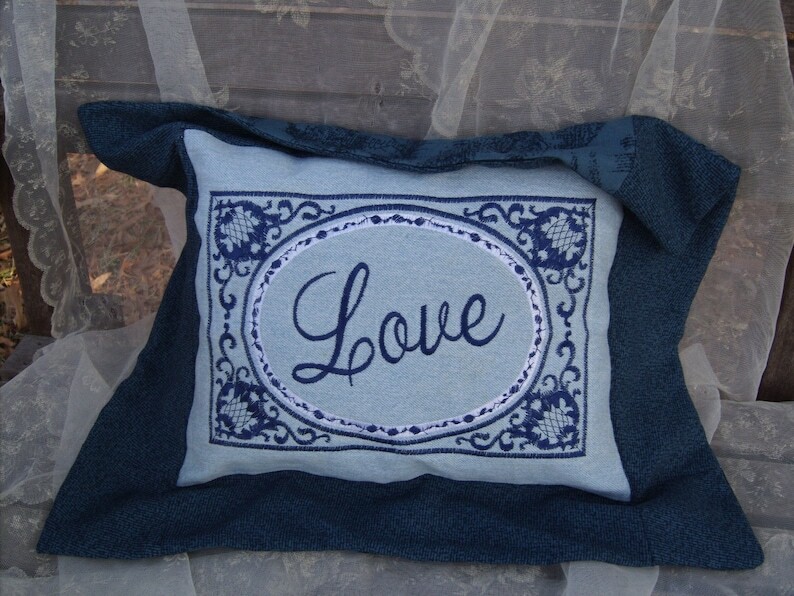 The body of the pillow measures 9x12" and is embroidered with a beautiful frame of white and navy. The word "Love" is embroidered in navy script. The flange border is 3" wide of rayon and is in contrasting fabrics of teal and dusty blue. The back of the pillow is also rayon fabric and includes the pocket of the shirt and buttons for removal. Pillow insert is handmade with new stuffing. All inside seams are serged for durability. Outside is topstitched. I reccomend hand washing in cold water, and air dry to prevent rayon fabric from shrinking. This is the second time I have ordered from bohemianblue and I am beyond satisfied! Each time the sash has come out perfect. Thank you! Very well made rune. I plan on buying more. ***You do not have to have a Paypal account to pay with your visa/mastercard through paypal. Click the payment button and it will give you the option to pay with credit card without signing up for a Paypal account. Ready to ship items will be processed and shipped as soon as payment is received. If you are using Etsy payments ready to ship items will not ship until payment has been deposited by Etsy. Special orders and personalized orders will ship in 1-3 weeks(unless otherwise noted or arrangement has been made with me) and you will be contacted via email when the item has shipped. Any Item purchased in Virginia will be subject to state tax as it is where I do business and am required to do so. If you feel the item is damaged or misrepresented, I will happily work with you on an exchange or a refund. I must hear from you within 7 days. You will be responsible for return shipping.Note measurement formulas below......I do not take returns for non-fit. Most items are shipped USPS priority mail. Items will ship in recycled boxes, bags and paper because I feel it is my duty to reuse and recycle. Each Item will be packed in a layer of plastic and wrapped in paper where neccessary. I will take the utmost care in insuring the item arrives safely to your door. At times, UPS or FED EX may be used and I am willing to upgrade orders you need to ship more quickly. I will not insure unless requested. As always....I will work WITH YOU to insure your satisfaction. International shipping is not accompanied with tracking as cost is too high. Though I will ship Internationally I will not be held responsible for lengthy shipping times. All Items are handmade by me, packaged by me and mailed by me. The best way to determine fit is by measurements. sizes are not always true. Take your measurements and tell me your typical size range. Example: size 4-5-6. Here's what else you need. WAIST - measured at the waistband. Note: Where you take this measurement is determined by where the jeans "fall" on your body or referred to as the RISE . (lo rise or lo cut, high waist, boyfriend which is just below the belly button, etc. so pick a pair of jeans that fit you exactly the way you like when you measure the rise) see below. REAR END RISE-measured from the crotch to the waistband in the back. HIPS - measured around the fullest part of your buttocks. INSEAM -(for pants) measured from crotch of the jeans, down the inside seam, to the bottom of the pant leg..or crotch to fbelow ankle if you are measuring your body. or to where you want the skirt to hit on your leg. Example: just below knee.